Certain applications require specialized materials for the construction of our casework. 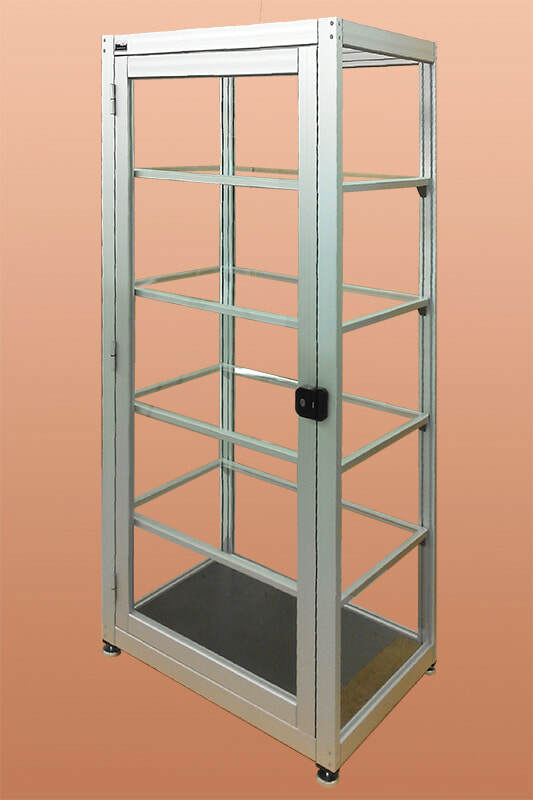 When strength and durability have a high priority, we have the experience and equipment to fabricate with aluminum structure systems such as Item Products and 80/20. On this project, a heavy duty truck manufacturing plant required see-through cabinets that were to be placed on the assembly line at multiple "robotic cells". Spare parts and other necessary consumables needed to be stored close to the cells where up to four robots performed various operations: drilling, punching, welding, gluing, etc. Each robotic arm grabbed different fixtures to do the various tasks, making quick connections to electric, pneumatic and hydraulic supplies. If a malfunction with a robot occurred, halting assembly, a spare part or entire fixture had to be readily available for the technicians to make the replacement and restore production. The client requested a solution in the form of a cabinet with clear sides and shelves which would give the technicians and supervisors the ability to assure that the correct spare parts and their quantities were always on hand. This was a feature that their previous steel storage cabinets could not provide. We fabricate with Item and 80/20 building systems!